It’s long been Brittany Nez’s dream to work in the aerospace industry, and she’s not waiting until graduation to do so. 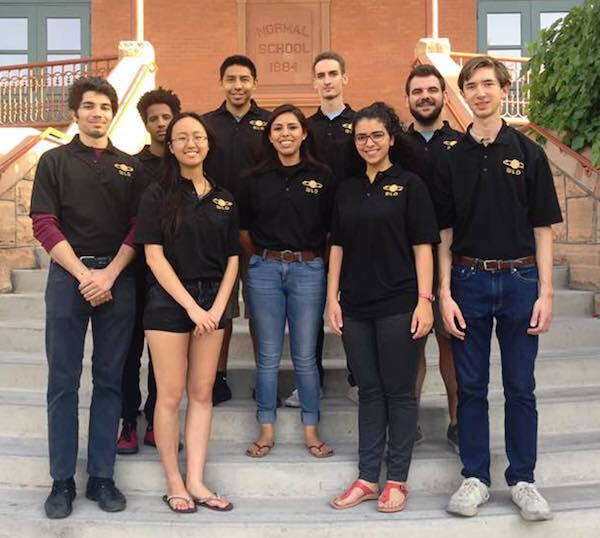 In fall 2015, the aerospace engineering senior founded the Arizona State University Next Level Devils to participate in NASA’s Micro-g Neutral Buoyancy Experiment Design Teams program, better known as Micro-g NExT. A year later, the team’s proposal has been accepted and they’re gearing up to take their design to NASA’s Neutral Buoyancy Laboratory near the Johnson Space Center in Houston, Texas, for testing this summer. 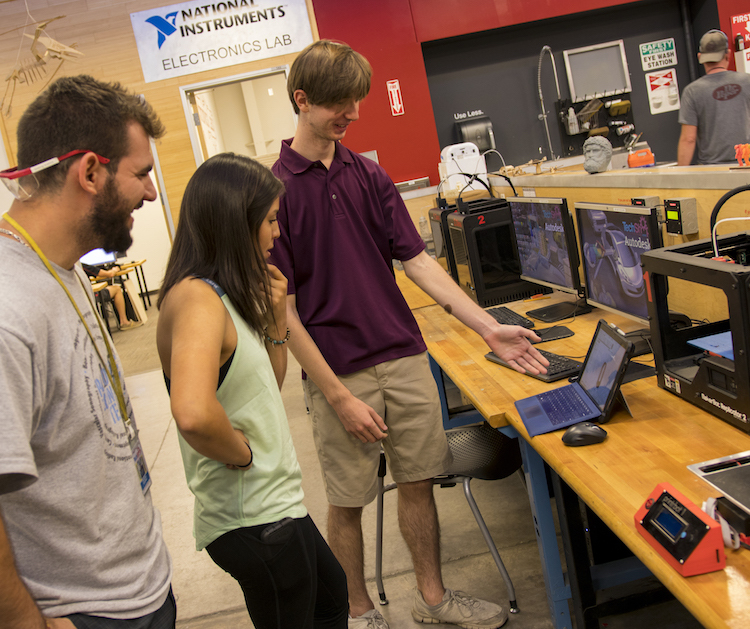 The Micro-g NExT program challenges undergraduate students to design, build and test a tool or device that addresses an authentic, current space exploration challenge. The testing of the designs is conducted by trained divers in the simulated microgravity environment of the NBL. 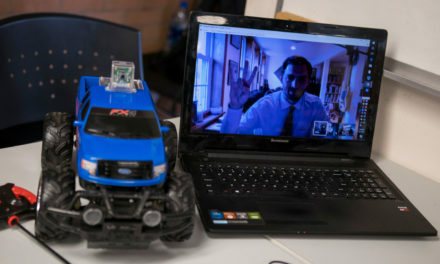 When the team of Ira A. Fulton Schools of Engineering students received the challenge in August 2016 they had three months to design and write the proposal. Their acceptance notice arrived in December 2016 and they have been manufacturing, testing and participating in outreach activities since then. While interning with the NASA Space Grant Program, Nez learned of the competition and ASU’s lack of representation in the program. Nez contacted a few fellow students on campus who she thought would be interested. The team set out preparing right away with meetings and some inspiration from Jack Lightholder, a former lead of the ASU Dust Devils Microgravity Team that participated in a similar program a few years prior. Lightholder inspired the team to continue with the project and work toward submitting an application for the 2015–2016 academic year. Unfortunately, the team ran into a design flaw and due to time restraints, they were unable to submit the proposal. The extra year also allowed the team more time in the design phase. The 12-student Next Level Devils team is very diverse, and each member brings something different to the table, according to Nez. Nez leads the group as team president. 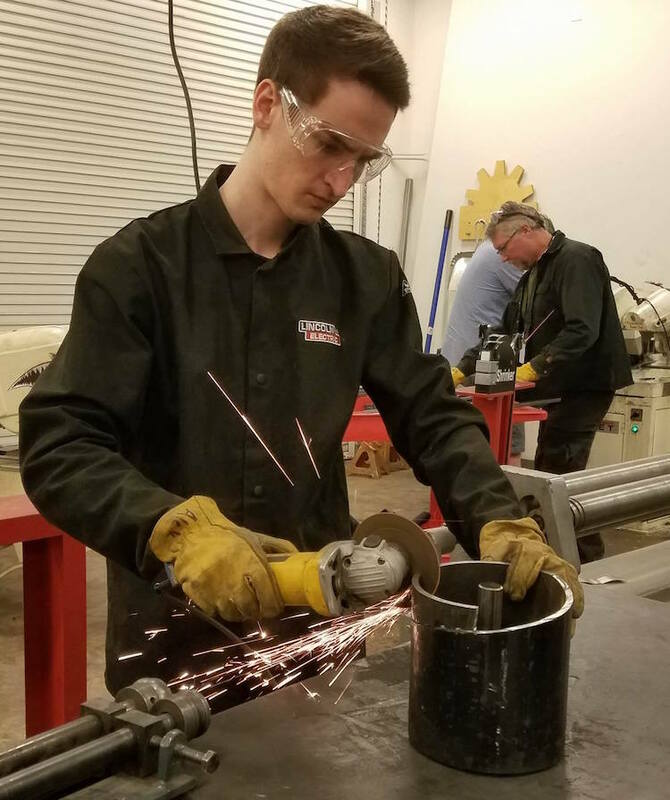 Aerospace engineering major Alek Cook is the team’s vice president and manufacturing lead and Hull is the team’s design lead, treasurer and secretary. The rest of the team is made up of aerospace engineering students Alessandro Laspina, Garrett Nez, Maria Samir, Christian Sclafani, Justine Tang, Evren Uner and Gashaw Bizana, who is both an aerospace and mechanical engineering student. Chemical engineering student Wakhile Shongwe and Robert Mann, a molecular biosciences and biotechnology student from the ASU School of Life Sciences round out the team. 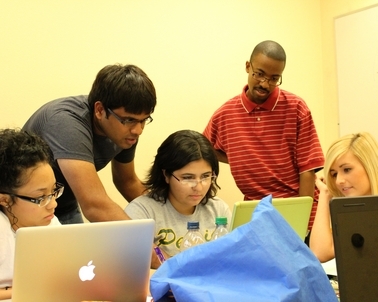 The team is mentored by mechanical and aerospace engineering Assistant Professor Hamid Marvi and Honors Faculty Fellow Joseph Foy from ASU’s Barrett, the Honors College. “We all have a different upbringing and different experiences that provides many perspectives to our challenge,” says Nez. When we think of objects in space we imagine them to be in zero-gravity. In actuality, they exist in a micro-gravity environment, meaning objects are outside the sphere of influence of a celestial body, but are still affected by pulls of gravity on a minuscule scale. NASA has discovered that it is extremely difficult to anchor to an unconsolidated surface in microgravity. Due to the small amount of gravity in space, especially when the bodies are as small as asteroids, anchors are needed to keep equipment and people on the surface. To avoid objects from floating off into space, an anchoring device is needed. This is where the Next Level Devils come in. 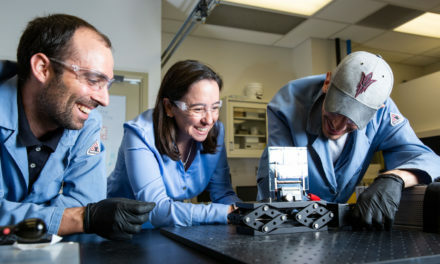 The team is building an air-powered anchoring device that will attach to the sand-like surface of a planet or asteroid. 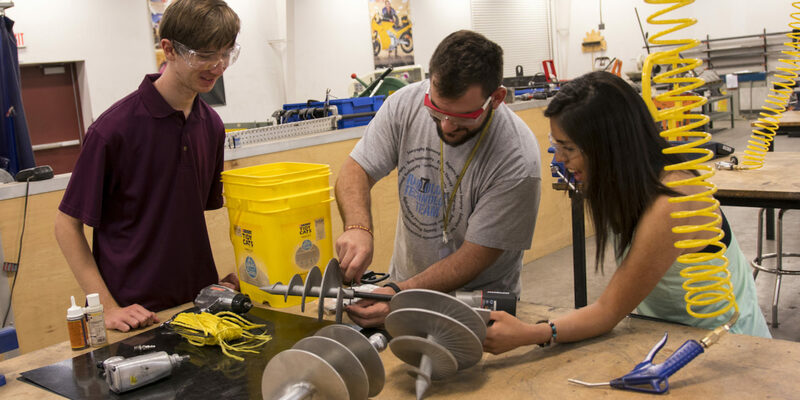 They will be testing their prototype auger design, crafted by the team using the TechShop Chandler facilities. 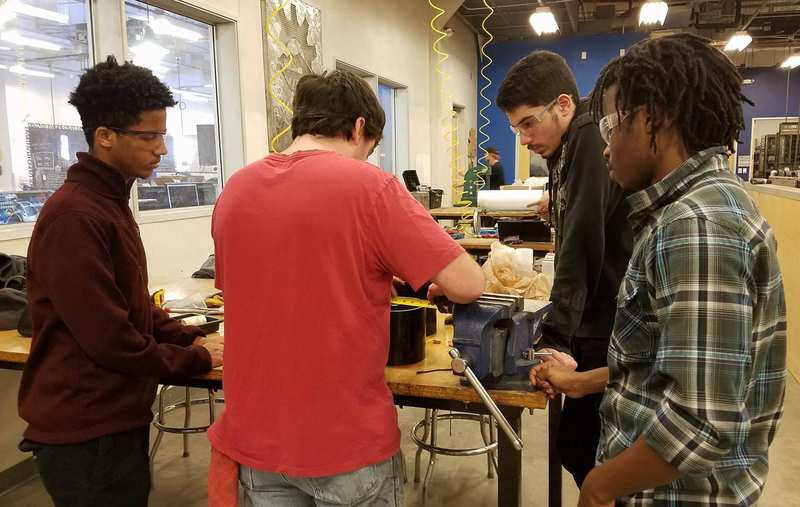 Additionally, Next Level Devils will be testing a pair of 3D–printed, aluminum drills provided to the team by Donald Godfrey and the additive manufacturing team at Honeywell Aerospace in Phoenix. The space industry is at the forefront of innovation with much of the research that goes into the space industry being used to correct issues on Earth. 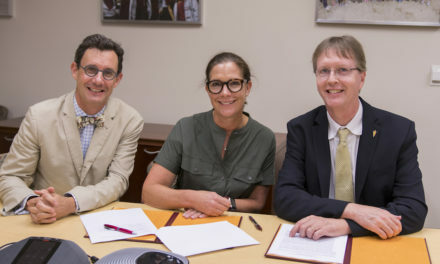 The goal for the Next Level Devils is to continue to build on their entrepreneurial and engineering skills that they will need in their future careers. With the team headed to Houston to test out their design this summer, Nez isn’t afraid to look beyond Next Level Devils. Each member on the team has put in a large amount of work and time into this project and Nez hopes that they feel accomplished after completing the program and realize that they are doing something they enjoy.